Despite what you’ll often read, the Nobel prizewinning nuclear physicist never suggested that aliens don’t exist. Two big ideas often come up in discussions about the search for extraterrestrial intelligence, or SETI. One is the Drake Equation, which estimates the number of civilizations in our Galaxy whose signals we might be able to detect—potentially thousands, according to plausible estimates. The other is the so-called Fermi paradox, which claims that we should see intelligent aliens here if they exist anywhere, because they would inevitably colonize the Galaxy by star travel—and since we don’t see any obvious signs of aliens here, searching for their signals is pointless. The Drake Equation is perfectly genuine: it was created by astronomer and SETI pioneer Frank Drake. The Fermi paradox, however, is a myth. It is named for the physicist Enrico Fermi—but Fermi never made such a claim. I’d like to explain why the so-called Fermi paradox is mistaken, based on my deep-dive research on the topic, because this mistake has inhibited the search for E.T., which I think is worthwhile. It was cited by Sen. William Proxmire (D-WI) as a reason for killing NASA’s SETI program in 1981; the program was restarted at the urging of Carl Sagan, but was killed dead in 1993 by Senator Richard Bryan (D-NV). Since then, no searches in the U.S. have received government funds, even though thousands of new planets have been discovered orbiting stars other than our sun. Enrico Fermi, a Nobel prizewinner who built the first nuclear reactor, never published a word on the subject of extraterrestrials. We know something about his views because physicist Eric Jones collected written accounts from the three surviving people present at a 1950 lunch in Los Alamos where the so-called Fermi paradox had its roots: Emil Konopinski, Edward Teller, and Herbert York (Fermi died in 1954). Both York and Teller seemed to think Fermi was questioning the feasibility of interstellar travel—nobody thought he was questioning the possible existence of extraterrestrial civilizations. So the so-called Fermi paradox—which does question the existence of E.T.—misrepresents Fermi’s views. Fermi’s skepticism about interstellar travel is not surprising, because in 1950 rockets had not yet reached orbit, much less another planet or star. If Fermi wasn’t the source of this pessimistic idea, where did it come from? 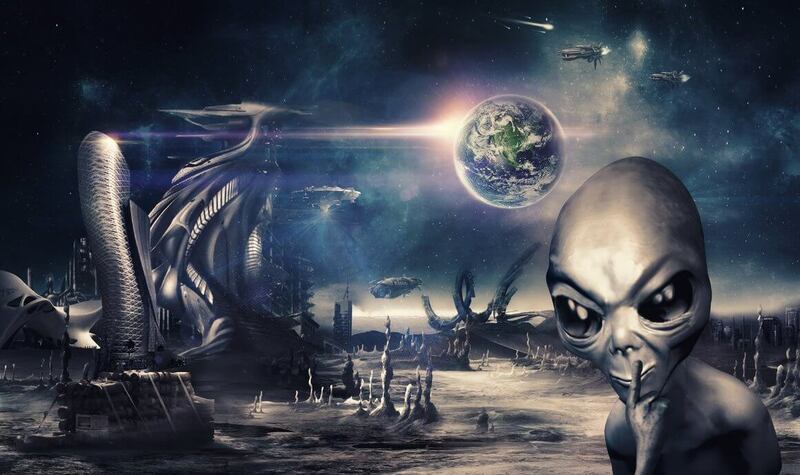 The notion “… they are not here; therefore they do not exist” first appeared in print in 1975, when astronomer Michael Hart claimed that if smart aliens existed, they would inevitably colonize the Milky Way. If they existed anywhere, they would be here. Since they aren’t, Hart concluded that humans are probably the only intelligent life in our galaxy, so that looking for intelligent life elsewhere is “probably a waste of time and money.” His argument has been challenged on many grounds—maybe star travel is not feasible, or maybe nobody chooses to colonize the galaxy, or maybe we were visited long ago and the evidence is buried with the dinosaurs—but the idea has become entrenched in thinking about alien civilizations. In 1980, the physicist Frank Tipler elaborated on Hart’s arguments by addressing one obvious question: where would anybody get the resources needed to colonize billions of stars? He suggested “a self-replicating universal constructor with intelligence comparable to the human level.” Just send one of these babies out to a neighboring star, tell it to build copies of itself using local materials, and send the copies on to other stars until the Galaxy is crawling with them. Tipler argued that absence of such gizmos on Earth proved that ours is the only intelligence anywhere in the entire Universe—not just the Milky Way galaxy—which seems like an awfully long leap from the absence of aliens on our one planet. Hart and Tipler clearly deserve credit for the idea at the heart of the so-called Fermi paradox. Over the years, however, their idea has been confused with Fermi’s original question. The confusion evidently started in 1977 when the physicist David G. Stephenson used the phrase ‘Fermi paradox’ in a paper citing Hart’s idea as one possible answer to Fermi’s question. The Fermi paradox might be more accurately called the ‘Hart-Tipler argument against the existence of technological extraterrestrials’, which does not sound quite as authoritative as the old name, but seems fairer to everybody. As for the paradox, there is none, even in Hart’s and Tipler’s arguments. There is no logical contradiction between the statement “E.T. might exist elsewhere” and the statement “E.T. is not here” because nobody knows that travel between the stars is possible in the first place. The Hart-Tipler argument, cloaked in the authority of Fermi’s name, has made some people pessimistic about the chances for success in SETI. But the suggestion that we should not look for intelligent life elsewhere because we don’t see aliens here is simply silly. There are some signs that the pessimism is lifting, most notably Yuri Milner’s privately funded Breakthrough Listen project, which promises to contribute $100 million in funding over ten years. But searching millions of stars for signals at unknown frequencies might take more resources. Our searches typically ’see’ a spot on the sky no bigger than the Moon at any moment, which is only a tiny fraction of the sky. If we want to find something interesting in our era, we might need to look harder.